Nothing is more refreshing than Springtime Artesian Water. In fact, consumers are so dedicated to the taste and freshness of our water, that no matter where their travels take them, they’re on the lookout for Springtime Artesian. 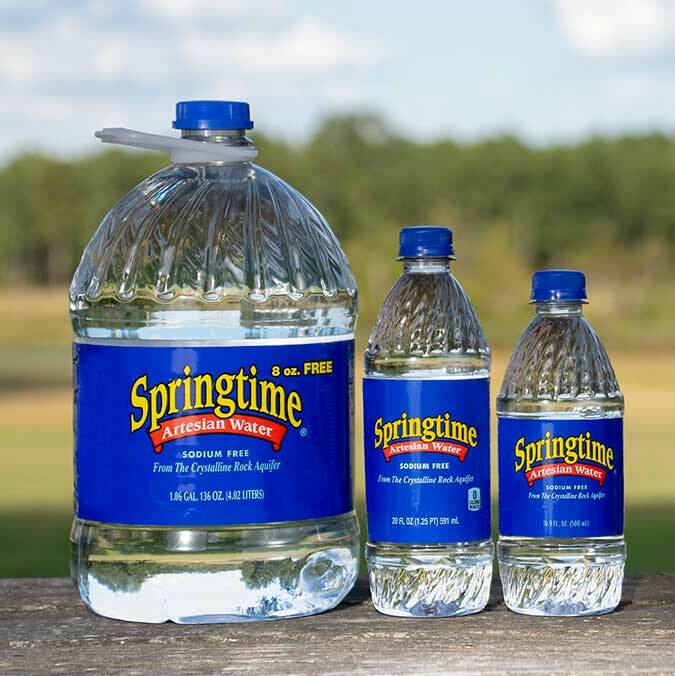 Springtime Artesian Water is distributed throughout the southeastern United States, and is available in 16.9oz, 20 oz, 1 liter, 1 gallon and 2.5 gallon sizes. With that much variety, there’s a Springtime for every occasion! No wonder it’s the favorite bottled water of tens of thousands of consumers! In 1986, Springtime Artesian Water was developed and marketed in the southeastern United States, becoming one of the first bottled water brands of its kind. With the advent of Springtime Artesian Water, Southern Beverage developed a revolutionary concept in the bottled water industry. It was our intention to replace the standard bulky one gallon dairy containers with an updated look–a fresh, clear bottle that could readily fit in a convenience store cooler door vault. The result was a product packaged in a lightweight PET plastic bottle, featuring attractive label graphics and efficiently produced on state of the art equipment running at speeds several times faster than rival production facilities in the industry at that time. While the premiere of Springtime Artesian Water may not have been met with the same advertising fanfare as some of the New Age beverages of that era, the quality and innovation of our products have been the key to our longevity in an ever changing marketplace. Our success is rather simple; not only were we pioneers in cold bottled water sales, our main goal has been consistent to provide value to the consumer. Coupling this fact with the tremendous customer preference for the taste of our product, we have nothing short of success in the making.